No. 1 Serena Williams hasn’t played since the US Open, so she is pretty raw. Plus, she was hurt 10 days ago due to her knee, so it’s very hard to tell whether she will be ready. 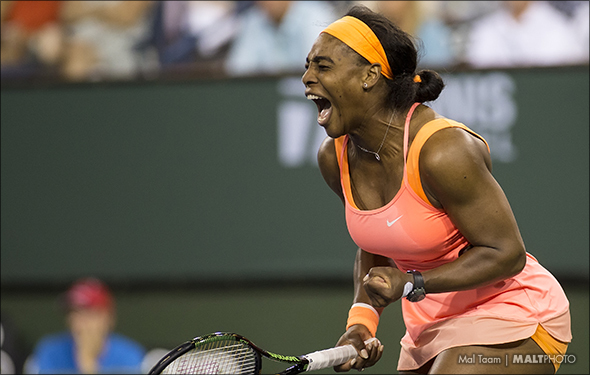 She said that she feels “130 percent.” If so, she can win seven matches winning 6-0, 6-0. She is that good. However, I don’t think she is 100 percent, not even 90 percent. She is super vulnerable. She could lose against Camilla Giorgi in the first set, yet while the Italian can strike the ball, she is inconsistent mentally. She could be troubled against Su-Wei Hsieh in the second round, or Anna Karolina Schmiedlova in the third round, but she scrape past them. But in the Round of 16 – she is gone against her close friend Caro Wozniacki. Time after time, Caro has been close but she has seasoned up. This week, the Danish will finally yank her around and make her very tired. Serena will throw a few dozen unforced errors and she will wave goodbye. It happens – for everyone. Maria Sharapova will be in the quarter, and if she had to face Williams once again, she could be shaky on court as she has lost so many times against her. But no matter. Sharapova has to reach the quarters first and she became hurt [everybody seems to be hurt] in Brisbane While she is feeling fine, she might not be 100 prix vrai cialis percent. We will see. However, Sharapova looked very good at the WTA Finals and the Fed Cup final. She seems relax and eager. She has a fine draw until the fourth round, when she will have to face Belinda Bencic or Svetlana Kuznetsova. The 18-year-old Bencic is coming hard, while Kuznetsova played a terrific contest in Sydney. Sharapova wants it more though, but she knows that if she can win a couple more majors, she has to do it soon. Allegedly, Bencic said she was ill a couple of day ago and had to pull out in Sydney. Now she has to face the hard-hitting American Riske who is playing well on the hard courts. A true toss-up. During the fall, Aga Radwanska really came alive, winning the WTA Finals. She won a tournament last week, too. While she certainly is not the out-and-out favorite, she is way up there. It’s time for the No. 4 Radwanska to finally shine and win a Slam. However, it won’t be easy. She will open up against Christina McHale, who can by super steady, then against Genie Bouchard, who can be super aggressive, and then against Sam Stosur, who can crush her heavy forehand. But the cagey Radwanska will figure it out. In the Round of 16 she will face Sloane Stephens, who won Auckland and that could be tough, assuming whether the American can figure it out. Let’s assume she will, and they will contest a very long match, but in the end, Radwanska will kiss the lines when it counts the most. Who will the Polish face in the quarters? In the other section, no one is playing healthy or playing well. (Petra Kvitova is ill once again.) How about Carla Suarez Navarro? but it doesn’t matter as Radwanska will beat her easily. The former finalist Cibulkova loves the tournament and will go all out to prove that she can reach top 10 again. The No. 28 Mladenovic is improving slowly but surely, plus she is a fine net charger. The bottom half is substantially weaker, but there are some excellent competitors. Here, Vika Azarenka and Garbine Muguruza will face each of the in the Round of 16. The No. 7 Angie Kerber has a very easy draw until the quarters, unless she gets nervous, which she won’t – yet. Azarenka will have to face Elina Svitolina in the third round, which could be tough as the Ukrainian can be very fast and hustle. But Azarenka was extremely impressive in winning Brisbane and she’s ready to try and win a Slam. No. 3 Muguruza has been hurt, but she is so strong and smarter now. Caroline Garcia can trouble her, but the Spaniard doesn’t disappear at times, which the Frenchwoman does. Yes, Muguruza can reach the final here, but Garbine appears to be a little bit nervous, while Azarenka seems very happy. The two-time Grand Slam champion at the AO will stop Muguruza, and then chop up Kerber, whom she beat in the Brisbane final. Azarenka can hit the hell out of the ball. The 20-year-old Duval is now ready to dance. Svitolina thinks she can reach the top 10 this year. It should be a true battle. Even though Simona Halep lost in the semifinals of Sydney in three long sets against Kuznetsova, at least she felt like her body held up and she didn’t feel hurt anymore. Time will tell, but if she is feeling good, she can actually win the Aussie Open for the first time. At first, she will have to run for a long time, against Alize Cornet in the second round (who won Hobart) and No. 31 Lesia Tsurenko in the third round. Halep will reach the Round of 16, when she will face Madison Keys (I would said Ana Ivanovic, but the Serbian did nothing at Auckland and Sydney), who can crush the ball. Keys haven’t done much since the summer and she will have to prove that she is ready to knock out the elite competitors. Halep will dig her out. In the quarters, Halep will go face Karolina Pliskova, who has so much potential, but the Czech can get down on herself, just like when she lost against Halep in Sydney. It was close, but Pliskova wasn’t patient enough. The No. 9 Pliskova could lose early because she can up and down mentally, but she will topple No. 8 Venus Williams in the fourth round. The 35-year-old Venus can reach the quarters, or even the semis, but it’s hard to see that. So many years ago, in 2003, Venus reached the final at the AO against Serena and she was right there. She was so close in the third set and just let it go. After that, she never reached a AO final again. I would be shocked if Venus manages to dominate during the next two weeks. Halep will get through into the semis, out stroking Pliskova once again. Remember when the Britain stunned Muguruza and Andrea Petkovic at the US Open before she lost to Kvitova? Pretty good stuff. She will push Venus super hard—and then she will lose in three sets.